These are three stages of a cover illustration I recently did for the magazine, Scout & Engineer. It's a publication dedicated to the discussion of current events via the ideological and philosophical underpinnings of the story. The pencil stage is to determine the layout and the overall theme and composition for the cover. This stage has always been the most fun and yet taxing. On one hand I have a perfectly blank space to fill up with no apparent hindrances, yet the responsibility of zeroing in on a given subject matter is the whole point. Here, the direction of the piece is agreed upon by the illustrator and the art director. The art director doesn't see the next midway stage. But it's here where I make final decisions on placement and emphasis of theme elements. Generally, I prefer doing the tedious (and important) details first because it takes advantage of my initial adrenaline burst. I like to leave the "dessert" for last; the part of the illustration that really drives home my style and approach to the idea. And, of course, the final. If you look carefully, you can see all the minute changes I made from the midway stage. I put all the lighting effects into play and try to finish with a certain bravado of technique and precision. 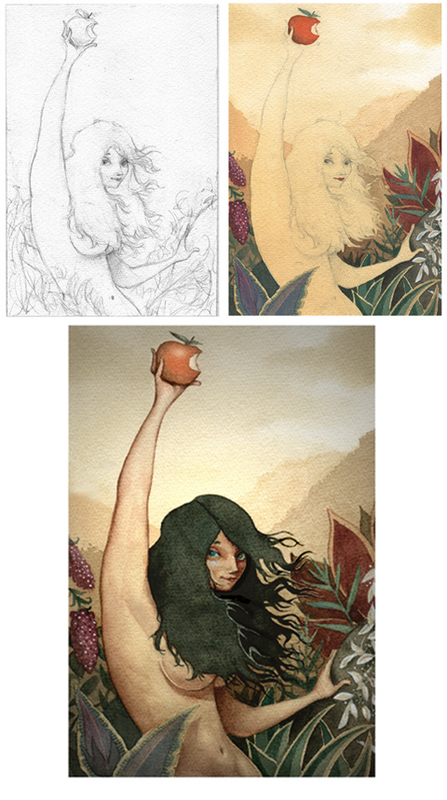 And there you have it; the illustration process in three easy steps. John, fascinating! Oh, and about how long do those "3 easy steps" take? Ever had an art director look at something and just say "I don't get it?" As they say down in Mexico, "Fleas in your navel Day!" An art director is actually looking to be surprised, in a good way of course. Any improvements I deem necessary are a given. If we are on the same page, his idea gets better with my participation. Of course, I've had moments where there was a bit of confusion, but I always manage to listen to his input and make the changes....as long as the IDEA is intact and the changes benefit the overall look. Have a splendid Christmas, yourself! That is very nice and the 3 steps are illuminating (or perhaps illustrative - double entendre intended), but I don't "buy into" the "easy" part of it for a minute. And a Merry Christmas and Happy Holidays to John and the rest of the crew of regulars. Fleas in your navy dad! :-) That sounds kind of insulting, so I'll just go with Merry Christmas! I love these posts, John, going through your process with tidbits like using your excitement to do the boring parts first. And this one is particularly beautiful with just the right amount of hubba-hubba. Scout & Engineer sounds like an interesting magazine. I'd say that knowledge is not sinful, but ignorance can be a moral defense. Alas, the Knowledge of Good and Evil came from doing evil. "Alas, the Knowledge of Good and Evil came from doing evil." Now that's an interesting observation! Leading to ... can there be "good" if there is no "evil" to measure against? However, the concept for the article misses the point. There's no reason to think that Adam & Eve (whom I believe are allegorical figures in & of an exponentially more magnificent point) would have been completely ignorant. They were forbidden to seek knowledge OF GOOD & EVIL. There were no restrictions imposed regarding knowledge & understanding of the truths regarding the physical or the metaphysical. AT LEAST have a nice day. Excellent contribution. I'm pretty the illustration was meant to a have wide target, open to the question, "What is knowledge?" Good question, G! I think that good cannot exist without the _possibility_ of evil. God has no dual, and evil is not His. Free will is the key and it is worth the possibility of evil. At the same time, it seems that the indelible blot of my own past sin brings visceral understanding with great motivation for me to do good (-er :-)). That occasional repulsive oddity may be part of the duality you see. The Sphinx: He who questions training only trains himself at asking questions. Mr. Furious: ...your rage will become your master? That's what you were going to say. Right? Right? And sometimes a cover illustration is just a cover illustration, ya know? This page contains a single entry from the blog posted on December 23, 2011 3:34 PM.